Why should I see a physical therapist for musicians? My teacher tells me to practice 5 or 6 hours a day. Is it possible to practice the piano for many hours without feeling pain? How should practice time be structured to help me perform to my best ability? As a flutist, should I breathe through my whole torso or only « low »? I can no longer play my pieces! I have concerts in several weeks, what can I do if I can't cancel them? I am / I am not active in sports. 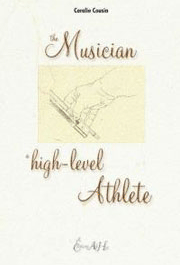 Should one participate in a particular sport when one is a musician? How do I find the right position for the instrument and for the body? The goal is to play in a pain-free position. Physiotherapists are trained to understand the interactivity of muscles, tendons, nerves etc and can work on problems in a coherent manner, since improvement on one level may be necessary to solve the next problem. Also, it's usually best for the therapist to be in contact with the professors, since their relationship to the musician is complementary. Each instrument has its constraints, and it is necessary to be familiar with them in order to prevent them from causing pain. The importance is to arrive at the best musical and technical result in the least amount of time which leaves time to study scores, go to concerts, exhibitions and to develop one's general culture. Naturally, students differ in the amount of time necessary to achieve maximum results and in no case should one suffer pain without immediately seeking help, first with the professor and then, if necessary with a physical therapist. First, always remember that concentration is your best friend, simply because it eliminates all non-musical thoughts. However, it's necessary to take a break at least every hour or even sooner. Most musicians develop simple exercises to help relax muscles during this period. It's important to be flexible about stopping -learn to obey your body! Rest is not always enough to heal. Take advantage of this down time, when your mind is less occupied, to reconstruct a balanced posture even if you are not playing. All wind players have various theories and vocabularies concerning breathing; often confusing, rarely admitting or truly understanding that breathing has to do with the lungs and the muscles essential to inhaling and exhaling. This physical act is complicated by the nature of sound production differing with each instrument and the size of the player. In this case it is important to regularly work with a physical therapist that can guarantee general physical well being. Please see the ‘first hand experiences’ category on the website. The performers I see regularly calculate that the time spent on regular visits is priceless next to canceled concert and 4 to 6 months of non-activity in the case of severe problems. Muscles have a memory of posture. Keeping the arm up for hours with a violin is not very natural. Use physical activity to relax, to stretch, to take pleasure. Swimming and jogging are very good physical activities. Yoga, tai-chi-chuan, and Chinese martial arts are relaxing for both the body and the mind. Alexander method, Feldenkrais method, Pilates are also often used by musicians. Avoiding pain is vital. You have to feel at ease with your body and not start playing an instrument with a faulty position. Above all, being properly placed is what matters most! Finding the right posture means learning to distribute the weight of your instrument whether you carry it or not, without unnecessary movements, and observing three basic rules: to have stable anchor points, to have vertical flexibility and to breathe according to the effort required. It is above all a personal experience, listening to the body and concentrating on its needs. Remember not to confuse slumping with releasing. If before playing, you let yourself go by pushing down towards the earth, you must absolutely correct this, as it is a misinterpretation of the body. Most of the time you are not aware of it, but your teacher can see it. You often do this believing that you are relaxing, but in fact it has nothing to do with the physical sensation of releasing.